Your eyesight is valuable, and the best way to keep it safe from the sun’s harmful UV rays is to equip yourself with a pair of premium sunglasses. Putting on shades is also the ultimate, contemporary way to accessorize and upgrade your appearance. To find the perfect pair for your unique look, shop our trending Ventura sunglasses collection. Don’t compromise when it comes to the specs you wear in the sun. An inexpensive pair of sunglasses from the drugstore rack can put your vision at risk. For ultimate protection, your sunglasses – whether they are non prescription or prescription sunglasses – must give 100% UV protection (from UVA and UVB rays). Don’t be fooled by the color of the lens tint, darker lenses have no connection to the level of blockage against ultraviolet rays! What is the connection between sunglasses and eye health? High quality sunglasses will help keep you safe from photokeratitis (similar to a sunburn on your eye surface), eye and eyelid cancers, ocular growths, and an increased risk of many age-related eye conditions, such as cataracts. It is essential that your sunglasses give you the sharpest eyesight possible for your vision condition. If you need vision correction for nearsightedness, farsightedness, astigmatism, or presbyopia, we can fit your prescription sunglasses with the precise lens powers that you require. In addition to lens power, the tint color of your sunglasses makes a difference for vision clarity, depending upon what you are doing and where you are. Tell us about your daily activities and hobbies, and we will advise you on the best type of sunglasses to enhance your sight. For example, polarized gray sunglasses are often best for days spent on or near the water, while amber lenses are better suited for golfing. Non prescription and prescription sunglasses are a sensational way to flatter your face and make the fashion statement you want. We stock a diverse array of shapes and styles from many world class names in the fashion world. Our collection includes designer sunglasses to suit every personality, including a fun selection of children’s sunglass frames. Enough talk about sunglasses, now it’s time to see for yourself! 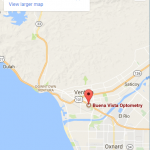 Pop in anytime to browse the spectacular shelves of sunwear for your eyes in our Ventura optical store. Watch this Sunwear Video for more information.